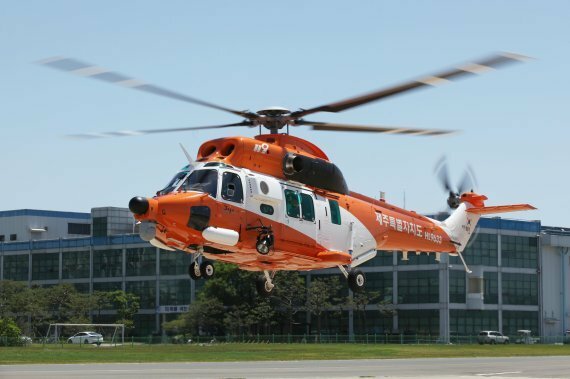 Korea Aerospace Industries said Thursday it delivered its KUH-1EM utility helicopter for medical emergencies to the Jeju fire safety authority, and its KUH-1FS utility helicopter for forest services to the Korea Forest Service. This is the first time for KAI to deliver its utility helicopters to the KFS and the National Fire Agency, which had previously relied on imported ones. “We will provide our full support for KUH-1EM and KUH-1FS to seek their operational stabilization at an early stage for public safety” said an official at KAI. KAI said its fire-fighting helicopter is equipped with high-tech devices to allow it to conduct diverse missions. The devices include those related to search and rescue, emergency patient transporting, fire suppressing, and transportation equipment. Its forest helicopter can be used to conduct major missions, such as the prevention and suppression of forest fires, and rescue activity in the event of mountain accidents, according to KAI.